The type of tire you’re going to want to choose for your forklift fleet depends very much on the type of terrain where your trucks will be operating. The fact is most environments require specific tires, and some due diligence may be required before you make a purchase. The safety and performance of your fleet depends on this decision, so do not take it lightly. In what type of environment will your forklifts be operating? Will your lifts mostly be operating indoors or outdoors? Is turning radius a deciding factor in your selection? If your forklift will be operating mostly outdoors, what type of surface will it be operating on, and what will it be lifting? Are there sharp objects on the ground? Pneumatic tires are the perfect option for an outdoor, rugged terrain. They have a strong grip on rough surfaces and uneven terrain – and are the tire of choice on construction sites, outdoor warehouses and storage facilities, and lumber yards. Cushioned tires can operate outdoors and indoors, but a smooth environment is preferable for these tires. They’re manufactured from solid rubber and molded to a rim. 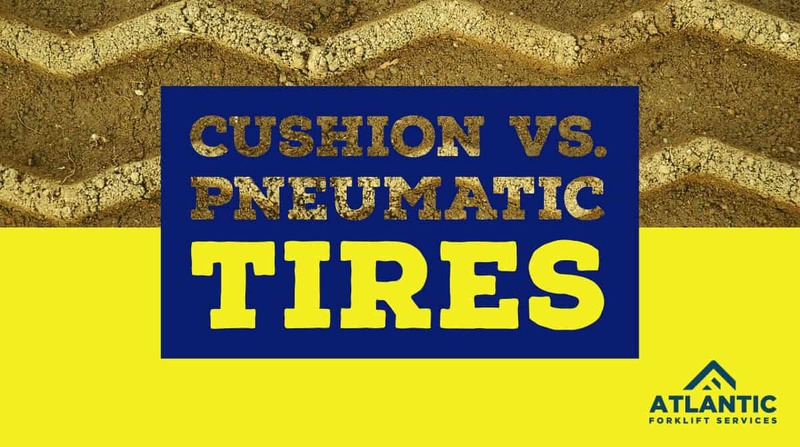 They are usually smooth, and don’t offer the same traction that a treaded pneumatic tire can offer – particularly outdoors. These tires are manufactured to be used indoors, on a smooth concrete surface. They are particularly effective in storage facilities with narrow aisles and areas where a tight turning radius is desired. Cushion tires sit lower than pneumatic tires, making outdoor use on rough terrain against recommendations. Take this decision very seriously. Of course you want your forklifts to operative as safely and efficiently as possible, but you also want them to be safe. This decision matters. Before you make it, contact our experts and they can help you navigate the tire option that is best for you.